What is Fake Antivirus Software? Most of you know how important it is to have security software on your computers to stay protected from viruses, malware, spam and other Internet threats. Unfortunately, cybercriminals also know that it is critical to have security software, and they are using this knowledge to trick us into downloading fake antivirus software that is designed to do harm to your computer. Fake antivirus software is one of the most persistent threats on the Internet today. It masquerades as legitimate software, but is actually a malicious program that extorts money from you to “fix” your computer. And often, this new “antivirus” program disables your legitimate security software that you already have, making it challenging to remove. These rogue programs often hook you while you’re browsing the web by displaying a popup window that warns the user that their computer may be infected. Often, the popup includes a link to download security software that offers to solve the problem, or redirects you to a site that sells the fake antivirus software. It is also often also called scareware since the hackers use messages like “You have a virus,” as a way to get you to click on their message. 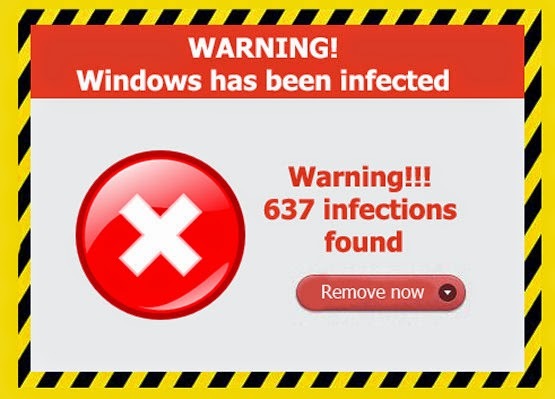 Because the idea of having an infected machine is alarming to us—it can mean lost data, time, and money—most of us are eager to get rid of any potential problems, and this is what has made the bad guys who make fake antivirus software so successful. And once you agree to the purchase, the cybercriminals end up with your credit card details and other personal information, and you get nothing but malware in return. Never click on a link in a popup window. If you see a message pop up that says you have a virus or are infected, click the “x” in the corner to close it. If you are concerned that your computer may be infected, run a scan using the legitimate security software you have installed on your device. Make sure you have comprehensive security installed on all your devices, like McAfee LiveSafe™ service, which protects all your PCs Macs, tablets, and smartphones from online threats as well as safeguarding your data and identity. While it is frightening to think that your computer may be infected, don’t fall for fake alerts that could compromise your personal and financial information. Take a minute to run a scan using your trusted security software rather than give more money to the bad guys. Robert Siciliano is an Online Security Expert to McAfee. He is the author of 99 Things You Wish You Knew Before Your Mobile was Hacked! Can the Apple TV 4K be a cord-cutter's only streaming device? Ads Online - Why Are They Following You Around The Web? Tech Magazine: What is Fake Antivirus Software?